It’s been three years since I first did a “How I Work” blog post (at the prompting of Tom McDonald) and since then I moved to a different full-time job and then to another (current) full-time job, where what I do is now almost completely different. And where I work has now shifted to my home office. So, I thought it would be fun to do an update of that post now. Some of the details have not changed, but I will share those that have. South of Boston, still, but in a different town. I work from home in a room we’ve set aside as the office, but which is also our primary library and the TV room, so occasionally, usually when the weather’s too bad outside or the kids are sick, I have to vacate and work from another room in order to let the kids watch a video. I am now the CEO of the StarQuest Production Network (SQPN), a podcast network whose show explore the intersection of faith and pop culture. I first became connected to SQPN as a listener more than 10 years ago when I started listening to Fr. Roderick Vonhogen’s podcasts and then to other shows on the network after it was formed about 2006. In 2010 and again in 2013, I helped organize SQPN’s Catholic New Media Conference when it was in Boston. Around the time of the second CNMC Boston, Fr. Roderick asked me to co-host the Secrets of Star Wars podcast with him. Later, I also joined the Secrets of Doctor Who in 2014. I became a part-time executive director in 2015 and then as of January 1, 2018, Fr. Roderick stepped down as CEO and I took over, first as part-time, and then on May 1, I took on the job full-time. I begin ever year with a look back at the year just ended to review how it was and to count my blessings before the new year starts1. In contrast to some recent years, 2017 was comparatively quiet and with less drama. Nevertheless, there were some notable moments. 2017 was the first full year of working for Massachusetts Citizens for Life as director for community engagement. Most notable for me was the rollout of a brand new website that is more than a website and more of a communications platform. It’s built on the Nationbuilder platform and includes built-in event management, ecommerce donations, mailing lists, and relationship manager. I’m still plumbing the depths of what it can do (as well as its limitations), but I’m happy with the change. Apart from that have been several interesting events that we’ve run, including my first time testifying at a legislative hearing on a proposed bill.It was a bit nerve-wracking and exhausting, but I was generally pleased by how it turned out. My “other job” at the Star Quest Production Network ended the year on a sad note. SQPN’s founder and primary voice, Fr. Roderick Vonhogen, has decided that he needs to collaborate with people closer to where he lives in the Netherlands and to go in a whole new direction with his his online media ministry and so Trideo and SQPN have split. I’m saddened that I will no longer be working with Fr. Roderick, who I’ve listened to for over a decade and who I’m glad has become a friend, and we’re still working on what SQPN is and will become without him. I’m sure we’ll find out in 2018. We had the opportunity to make some much-needed home improvements this year. We started out with new manufactured wood floors to replace the old ones that had begun to move around like a bad version of a sliding puzzle game. In the spring we replaced our ancient furnace/boiler with a brand new and much more efficient one, thanks to a generous rebate program through our local energy collaborative. However, it did mean 48 hours with no hot water or heat and a whole day with no water at all. But now we can run hot baths for our kids without having to boil pots of water on the stove. We also got our chimney and living room ceiling repaired. The chimney was leaking like a sieve, which caused our living room ceiling to leak and get stained. We finally had the resources for repair work, so we got a professional chimney guy to do the chimney and then had professional interior guys in to replace the ceiling. I’m glad we finally did because they found so much mold in the ceiling that when it was all gone, Melanie had a noticeable difference in her asthma and sinus infections. I’m sorry we didn’t do it sooner. This summer, when my father-in-law came to visit, he started building Melanie’s long-desired patio in our backyard. She’s wanted one since we moved into this house 9 years ago and so this summer he bought a gazebo/sun shelter and then flew up to build the patio itself. Unfortunately, he put the shelter up first and tried to build the patio under it, which meant some difficult maneuvering. Then he was only able to get about half done before he had to leave and so I spent several days figuring out how to do what needed to be done. The final product isn’t as level as I’d like, but it’s a great addition to our living space. However, as we end the year, we have a number of expensive repairs looking at us. One of the elements on the electric oven gave out and that’s going to cost $170 to repair and the over-the-stove microwave oven has started running when you open the door, which isn’t good at all. That should be about $250 to replace. I’m also worried about the dishwasher again and even the refrigerator, which is getting close to being a decade old. For summer vacation, we had a kind of last-minute opportunity to get a week at the lake house in Maine we’d been able to get two years ago, this time in June. The first few days it was very hot and then got a little more seasonal (i.e. chillier) the rest of the week, but it was sunny every day except the last. We pretty much just swam every day, hung out, did puzzles, played games, and read. It was a quiet and relaxing week. We did have Melanie’s sister Theresa visiting from Texas at the time and she stayed with us the first couple of days in Maine before Melanie had to drive her back to catch a bus to catch a plane back home. As Melanie and I get older, we have more and more of those little health issues that seem to crop up and I get to look forward to turning 50 next year and getting some, um, invasive tests at my next annual physical. Otherwise, everybody was pretty healthy. Okay, Lucy did have to get a couple of stitches for a nasty gash above her eye right before our lake house vacation and Melanie did have to ask for a suture removal kit from the doctor because we weren’t going to be anywhere near a doctor’s office when they needed to be remove and Melanie did accidentally cut the ends too short so it was near impossible to pull the stitches out with tweezers, but eventually we did and it was all good. At least we didn’t have any hospital stays in 2017. In fact, everything was going pretty well until December when we caught the plague. The week before flying to Texas (more on that in second), the kids starting getting fevers and coughs. The worst of it came and went the beginning of the week, but the effects lingered into our trip to Texas and then continued to linger when we came back. Anthony and I had the most terrible coughing fits and it was hard to do anything about them as we rushed to get ready for Christmas in one week. Finally, both Anthony and I separately got to see doctors and get some medication that seem to help. That’s when we got the stomach bug from hell. For a period of about 12 hours, four of the five kids were all sick, throwing up over and over. Poor Melanie was up all night, cleaning up vomit, washing load after load of towels, sheets, and clothes. But as we head into the new year, we seem to be better. Also, while it falls under the topic of health, the fact that Isabella got prescription glasses for the first time isn’t really an ailment. Bella’s new glasses were indeed one of the best things to happen for her this year because she was having so much trouble reading signs and seeing other things that were readily legible to everyone else. As for the kids themselves, they’re all growing up nicely. Isabella, turning 12 in spring 2018, is almost my height now and acting more and more mature. She’s also a book devourer. We got her a Kindle for her birthday and she’s constantly reading new books and re-reading old books and always has her nose stuck in some book. Sophia is also maturing and while it’s easy to overlook given Bella’s growth spurt, Sophia is getting tall too. She’s not as much of a book worm as Bella, but she does love her books too. She’s just more measured in how she reads them, very disciplined in a chapter a day at bed time, for instance. Ben and Anthony joined Cub Scouts (which means I did too) and we’re all so very excited about this new experience. I’m especially happy to have them meet other boys and interact with other men in order to develop some socialization skills. I’m also reminded of how well they behave compared to the other boys their age. Lucia is turning 5, but she’s still so wee that it’s easy to forget how old she is … that is until she opens her mouth and says something so very precocious. She’s still very easygoing and mature for her age. An important milestone this year was Ben’s First Communion. He was so very solemn and excited by it. He’s definitely a “still waters run deep” kind of guy. In fact, after the First Communion, he decided all on his own that he wanted to keep wearing his suit and tie every week. And even now that he’s outgrown his jacket, he still insists on a tie every Sunday. So proud of him. We took a number of field trips this year, as usual, but because of my work situation I was unable to join them on as many. There were a couple of trips to the Museum of Science; some trips to the Museum of Fine Arts (including one I was able to go on that started with a punctured tire on the van and an unexpected stop to replace it); Battleship Cove (where Lucia almost fell headfirst down a ladder to what would have certainly been a serious injury, but miraculously caught her foot on something); a one-woman play about the only female Colonial soldier, Deborah Sampson; an owl biologist at the local library; a performance of “Merchant of Venice” for Shakespeare in the Park; exploration of life in a salt marsh in Duxbury Beach; a lesson in local geology while exploring colonial-era stone farm fences in Rhode Island; several other nature walks in Plymouth looking at aquatic creatures and fungi and more; and a couple of hands-on art workshops for kids at Boston College’s McMullen Museum of Art. And while it wasn’t exactly a field trip, we did have a lot of excitement surrounding the solar eclipse this summer, which was only partial where we live. Nevertheless, we made some eclipse viewers out of some cereal boxes and had a lot of fun watching the crescent shape form in the shadow. In mid-December, we visited Austin, Texas again for the first time in five years., since Melanie’s brother’s wedding. It’s just very expensive to fly all 7 of us (and at that Melanie’s parents generously paid for our flights), even with a discount airline, it makes sense for her family to fly up and visit. However, neither of her brothers have managed to come up and she hadn’t seen them in five years. But the real reason for going down was to celebrate Melanie’s parents’ 50th wedding anniversary. We had a great time visiting and managed to get out almost every day to enjoy the mostly good weather and visit the sites. We went to the famed Zilker Park one day and rode on the Zilker Zephyr a scaled-down train. We visited the Bullock Museum of Texas History, which was a real unexpected hit, very well done, and included a neat History of Computer Games exhibit that I geeked out over. Another day we went to the University of Texas Blanton art museum, which was small, but had some very nice art from the medieval and renaissance eras. I wasn’t as thrilled with the modern art. And of course, I went to see Star Wars: The Last Jedi with my mother-in-law on opening day. Then there was the food. Our tradition upon arrival in Austin is always to go to Taqueria Guadalajara Arandas, near Melanie’s parents’ house, for some amazing, simple Tex Mex. We got Tex Mex several times, including at Chuys near the park. After the Texas museum, went to a Greek restaurant that was very good (but didn’t have avgolemono soup and acted like they never heard of it?). Before the Blanton art museum, we stopped at Top Notch, Melanie’s favorite drive-in burger place from childhood that indeed had some mighty fine burgers. After their anniversary Mass, Melanie’s parents got the most amazing takeout barbecue from Ruby’s BBQ. One day we went out for great ice cream with mix-ins from Amy’s Ice Cream. And on the second-to-last day, I got my wish and was able to try an In-n-Out Burger Double-Double Animal-Style. It was indeed a great trip and I hope it’s not five years before we go back again. As usual, a new year saw some new technology showing up. I’ve managed to get myself on a yearly upgrade program with my iPhone and this year I dithered between getting an iPhone 8 Plus or an iPhone X to replace my iPhone 7 Plus. I knew I’d be fine with the 8 Plus and wondered if the higher price of the X was worth it. Finally, I figured out a way to get the X without paying too much more and decided to go for it.3 I have not regretted it. Face ID is a revelation, almost like not having a password at all. I don’t even have to think about it most of the time. And the photos and video are amazing, even better than the already great 7 Plus camera. The speed of the phone is great too, as is the beautiful display. I’m happy with my phone. The other big piece of technology this year was the purchase of an iMac 27” Retina 5K. This was a purchase by SQPN, the podcast network I work for as executive director, as I’ll be doing more and more audio editing and other heavy lifting work in the new year. This is an amazing machine, so very fast with lots of RAM and a big hard drive. After a couple of years using a MacBook Pro as my primary machine, it was great to have that freedom and elbow room again. Of course, you can never have too much monitor space so I supplemented the built-in 27” screen with a second 27” monitor to sit next to it. It’s not quite twice as much desktop since the second screen is not 4K, but it’s still great to be able to get all my windows viewable at once. Another tech addition this year was my new Synology DS-216+II4. I had another older Synology network-attached storage (NAS) unit serving as a big place to store all my big or rarely used files, but it wasn’t quite fast enough. The beauty of a NAS is that it is itself a computer and can run programs. One that I use is Plex, which is a media server. I like to rip my DVDs and Blu-Ray discs and store them on the NAS so that we can watch them whenever we want without having to fiddle with discs and boxes and such. It also works as a personal cloud storage for holding stuff that’s too sensitive or too big to keep in the cloud. I also use it as a backup server, backing up my computer, but then also storing a backup offsite on Amazon AWS Glacial storage. And it does several other things for me as well. The nice thing about the new NAS is that it has a much better CPU and more RAM so it’s much faster at nearly everything. For instance, it transcodes movies so fast that it doesn’t stutter when playing them back on my AppleTX any more. I almost forgot that my Apple Watch Series 1 was also 2017 purchase. For a long time I didn’t jump on the bandwagon because I needed to see that it could be more useful than simply taking my iPhone out of my pocket. When Watch OS 3 came out along with the newer faster Series 1 and 2 watches, I saw that it was finally time. It’s been great having the watch this past year. Not only does it provide cool fitness tracking and prompts but it gives me access to notifications and reminders at a glance, including marking as complete; I can take phone calls if my phone is in the other room; it gives me access to my two-factor authentication system on my wrist; it lets me record a note for myself; it keeps me informed of messages without the intrusiveness of pulling out my phone to look at it; and more. I liked it so much and Melanie was so intrigued by it that I gave her one for her birthday. And it has become my normally tech agnostic wife’s most favored gadget. There were also the usual new installments in favored book series, as well Star Trek and Star Wars books. Podcasts continue to be an important part of my life, but I realize my podcasts habits really haven’t changed and I’m still listening to the same list of podcasts I listened to last year. There were a couple of additions though. My good friend Patrick Coffin has gone independent and has a wonderful interview-based show, The Patrick Coffin Show, which includes everyone from White House advisers to former FBI agents to Hollywood stars to academics on the front lines of the culture wars. With his blend of humor and insightfulness, Patrick always elicits a great interview from his A-list of guests. The other addition is also a new show, OSV On-The-Go. This is a short format weekly show hosted by Greg Willits that offers to-the-point commentary and information on a Catholic topic, like How to Celebrate Christmas as a Catholic or How to Defend the Faith Without Raising Your Voice. Obviously, Star Wars: The Last Jedi was my most anticipated movie of 2017, but some others made my list of top movies, including Guardians of the Galaxy, Volume 2, Moana (a surprise addition), Wonder Woman, Logan, and Spider-Man: Homecoming. There were also plenty of others I saw that were from previous years that I’m only now catching up on via Netflix DVD and streaming and all the other new releases that I couldn’t get to the theater to see and haven’t watched on streaming yet. As for TV, some of my favorite new shows are SEAL Team, S.W.A.T., The Good Place, The Orville, and Star Trek: Discovery. For several years, food TV personality Alton Brown5 has had a seres of traveling culinary comedy shows that I kept seeing him talk about and other people rave about. Last spring, I saw that he was coming to Boston in October and Melanie agreed that I should get us a pair of tickets as a birthday present for me. We were able to go for a rare night out, including dinner and then the show. The seats were nosebleed, high above the stage of the Wang Theatre in tiny seats and a very, very hot atmosphere, but no matter: The Eat Your Science Tour was a very fun evening of jokes, audience participation and food-related hijinks. Melanie had a great time. I hope to be able to see him again the next time he has another show come through town. We continued to welcome Melanie’s family to visit us throughout the year. Because we don’t have a lot of room they usually come one at a time, although this Fall, Melanie’s dad and sister came together in order to do some foliage tourism together. But the visits began in June, which is a good time for Texans to visit because it’s getting super-hot there while our weather is just getting nice. Theresa came up for about 10 days, part of which included the aforementioned few days at the lake house in Maine, as well as Ben’s First Communion in early June on Pentecost Sunday. The a couple of weeks later, Melanie’s mom flew in on the Fourth of July to stay for a couple of weeks, including being here for Ben’s birthday. And then in August, Melanie’s dad came for a couple of weeks, which included the gazebo and patio work I mentioned earlier. Finally, in October, Theresa and my father-in-law came back to visit and do some day trips up to New Hampshire and Vermont to see the changing of the leaves. We also had some sad moments in 2017 with extended family. My dad’s wife, Mary Ellen, died after a long battle with a degenerative disease. My 85-year-old dad had been taking care of her for years, with the help of my half-sisters, and while they were very loving and heroic, I could see the toll it took on all of them. That was in the spring. This fall, my dad fell coming out of church one Sunday, breaking his leg badly and was hospitalized. Things were touch and go for a while, but eventually he was able to recover without surgery, including a stint in rehab. The upside is that after he was discharged, he didn’t move back to his house that’s some distance away from his older kids, but moved into my brother Bernie’s house, where he’s close by. I end as I usually do by looking ahead and behind. Like I said, we have some expensive home improvement ahead, but we’re also working on getting solar panels installed, which should bring down our electricity costs. There are big changes at SQPN, which have to get sorted out to see what the future holds there, but I’m hopeful. I’m sure there will be plenty else that is unexpected as well. But what I’m hopeful for is that 2018 continues to see us healthy and living together in a home full of faith and joy and love. It’s my custom to start the new year with a personal review of the year just ended1. While many people claim 2016 to be the worst year ever, it was far from that for us, although we did have quite a bit more upheaval than in past years, including a job change, new cars, and quite a few unexpected expenses. In March, I was informed that I would be laid off from my job as Communications Director at the Catholic collaborative in Walpole, Mass. After the collaborative was pared down from three parishes to two, expenses were too high compared to income. I’m also sure that some people questioned why parishes need a communications director. Part of the problem is that communications director is a title you find in corporations and government. A more accurate and palatable title would have been evangelization director, which would have encompassed all the same duties and responsibilities. I didn’t stay unemployed for long. 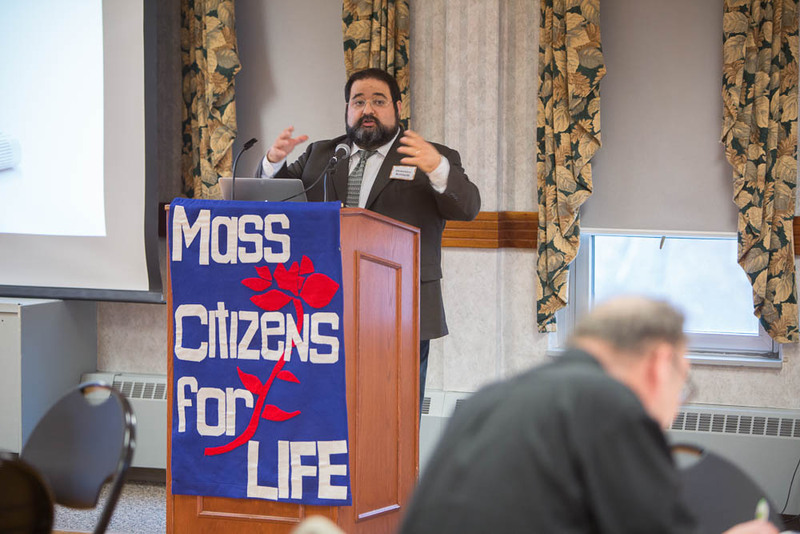 In fact, within a few days I was in contact with my current employer at Massachusetts Citizens for Life, where I started immediately as Director of Community Engagement, where I’m working on reaching out to new demographics, primarily through online means. It’s been interesting and educational so far, and you might imagine that in Massachusetts, it’s quite a challenge. Continuing my annual tradition, here’s my review of the past year in our life. We end the year pretty much how we started it with no major changes in our family or my employment. We have no new children nor pregnancies, which is like last year, but unlike every other year of our marriage. I have the same job and we live in the same house, driving the same cars. In addition to my work as Communications Director of a collaborative of two parishes here in the Archdiocese of Boston (down from three at the beginning of 2015), I have now also been hired part-time as the Managing Director/COO of SQPN, which is quite exciting as I’ve worked with them for a number of years on several projects and been a part of the listener community for even longer, back to the beginnings. We’re just getting started, but our main priority in the near term is to re-focus on the mission of Catholic new media and begin putting our resources there. On the other hand, Fr. Chip Hines and I ended our weekly radio program on the Station of the Cross radio network because it was too much for us both to keep up with while doing our other work. We started the year with me showing the kids “Star Wars” for the first time, which resulted in it occupying a lot of their imaginary games for the rest of the year. At the other end of the year, we had an actual new Star Wars movie, “The Force Awakens”, which I saw first by myself on opening night and then a few days later again, with Melanie. Short review: Awesome. Everything I’d hoped for and more. In 2014, our big vacation was a trip to Virginia and Washington, DC, to visit my mom and sister. This year we stayed a bit closer to home, although even up to relatively late in the year, we didn’t know what we were going to do. It turned out that we were able to rent a lakeside cottage in western Maine at a very generous rate and it was amazing. For a week, we lived in a beautiful well-appointed house on a hillside so that it had three split levels. The main level included a deck overlooking the lake that was a quiet spot for early morning coffee and prayer while listening to the loons cry. There was also a swimming dock and the kids and I spent time nearly every day in the water. It was so amazing to be there that I kind of went in mourning when we came back to our smaller house without it’s open, airy floor plan and serene vistas. While we had Sophia’s First Confession and First Communion in 2015, unlike Isabella’s sacraments, done by herself at our local parish, Sophia’s First Communion was done with other homeschoolers at St. Adelaide’s parish in Peabody, along with her cousin, my sister’s daughter, and other children. She’s been so happy with receiving Communion, even if a bit less so with Confession. (She gets very nervous when we bring up the subject of Confession.) Just this past Christmas, she told me and Melanie that even better than going to Midnight Mass is going to Midnight Mass and receiving Jesus in the Eucharist. Since her First Communion, either Melanie or I have had to make sure to go up to receive behind her because she’s so tiny that often the priests or extraordinary ministers of the Eucharist just pass over her. I have to make sure they know it’s okay for her to receive. We didn’t get out of 2015 without our share of bumps and bruises, but it could have been worse. Lucia had the worst of it. She got a cold last summer that really made her latent asthma so much worse that Melanie took her to the local emergency room. They were concerned enough that they sent her and Melanie in an ambulance to Children’s Hospital in Boston where they stayed overnight. That was a little nerve-wracking. Thankfully, my brother John and his wife Patti and my niece came to save the day by watching the kids and picking up my car that I left at the hospital as I went into Boston to bring Melanie and Lucia an overnight bag of essentials. Everything turned out all right, although Lucia does have to take a round of nebulizer medicine every night before bed now. Ben also got a visit to the ER in December when leapt from one piece of furniture to another, not quite making it and splitting open the skin over his eyebrow. That one took 10 stitches but he was a trooper as well, very stoic about it. That’s good because a few weeks later, he had to go to the dentist to get a tooth extracted and a couple of cavities filled. Oy. While my favorite technology company, Apple, was pushing out a bunch of new products, I did not jump at the biggest debut, the Apple Watch. I think it’s a fine product that will continue to evolve into something that I will eventually need, but for what it does today and at the current price, I can’t justify it in my life. For others, it’s just the thing and I’m glad for them. And while my iPad 4 continues to decline slowly following the dropping mishap last year, I haven’t yet reached the point where I have to replace it. The new iPhone 6s Plus might be the reason why. When the iPhone 6/6 Plus came out in 2014, I was torn over whether to get the larger screen. So many reviewers and pundits made such a big deal over how large it is and unwieldy for people with small hands (and I do have stubby fingers) that I had stayed away. But I finally decided that the bigger battery and video and photo stabilizations that it has and the plain old 6 doesn’t made it worth it. Then when I finally had it in hand, I realized all those size concerns were overblown. It’s such a great screen and so large that I use it for some of the things I used the iPad for. As for other tech, I did spring for the new AppleTV 4, whose biggest distinction is the ability to have 3rd-party apps. With the addition of the Plex app and having a Synology network-attached storage, I can now drop ripped videos from DVDs and Blu-rays onto the NAS and play them on our TV in glorious HD with no muss or fuss. The combination of the three pieces have been a wonder. At the beginning of 2015, I signed up for the Goodreads annual reading challenge, in which I pledged to read 30 books last year. It wasn’t exactly a lofty goal, compared to some of my friends or to Melanie’s book-consuming rate or even to me in my reading prime, but for me now, this would be a substantial increase over my recent consumption of books in which I read three or four books per year. I’m happy to say I managed to complete 32 books in 2015 and that’s how many I’ve set as my goal for this year. This is a pace of two or three per month. That’s a high rate for me even now, but possible, especially if I intersperse some of the denser non-fiction reading with some light science fiction like I did last year. The secret to my increased reading success has been my reliance on the Kindle for all but one of the books I read, which gave me the ability to read in bed in the dark without waking the baby or Melanie. Plus the impetus provided by gameifying the reading challenge. Nothing like a bit of competitiveness to get me motivated. Most of the usual host of out-of-town relatives came to visit this year. Melanie’s sister, Theresa, came in April for Sophia’s First Communion–since she is her godmother–and then again for Christmas and New Year’s. Melanie’s mom and dad also took turns visiting, her mom coming in August and then her dad in September for a week or so each. These visits are so nice, not just because we get to see them and the kids get to spend time with their grandparents and aunt, but also because having another adult gives Melanie and me the opportunity to go out for a night. When her mom came in August, Melanie and I had an amazing dinner for her birthday at the Scarlet Oak Tavern in Hingham. We drive by it every time we go to the farmers market and have wanted to stop in. And in December, it was Theresa’s visit that allowed us to go out to dinner and then see Star Wars together. We had a number of fun trips out and about this year. In the spring, once the great thaw actually began, we drove up north of Boston to Hollis Hills Farm to watch them make maple syrup. It was quite impressive to watch all the steam bubble out of the evaporator. They also raised other crops and animals and provided a full breakfast of their own eggs, pancakes, bacon and sausage and, of course, maple syrup. Continuing to revel in our Revolutionary War history, we took another day to walk the Freedom Trail in Boston. Even though I grew up here, I’d never done it, so we drove into Boston, parked under the Common, and then followed the trail from the State House to the old Granary Burials Grounds to King’s Chapel to Fanueil Hall with a couple stops in between. Despite all the walking, the kids handled it very well. The trail goes beyond Fanueil Hall into the North End and over to Charlestown so maybe we’ll do that this year. We also returned to our old standbys as well. The Museum of Fine Arts, where we have a membership, had two great exhibitions this year, showing the art of the Japanese artist Hokusai and the Dutch masters in the age of Rembrandt and Vermeer. Both were phenomenal, going beyond just the art work to stimulate discussion of history, culture and society. The kids loved it as much as we did. Our one-year membership to the New England Aquarium ran out this summer and so we made a last visit in July, taking the ferry boat from Hingham to Rowe’s Wharf as before. The boat ride is a much a highlight of the trip as the aquarium itself. While the animals and exhibits are great, the aquarium always seems to be so crowded so we tend to reach our limits early. And because we’re bound by the schedule of the ferry which runs with big time gaps in the middle of the day, we usually spend a lot of time waiting for the boat to come so as not to miss it. Of course, we had a lot of other little trips to World’s End in Hingham and to apple picking and Melanie often takes them on school-related trips, but another big highlight for me came on an outing, not with the family, but with my work colleagues. One of my coworkers is a season-ticket holder with the Boston Red Sox and one of the perks is the ability to take part in a kind of public batting practice on the field when the team is out of town. So in late June, as a gift to the pastor, Fr. Chip, we boarded a charted bus, rode into Boston, and Fr. Chip took BP on the field. Afterward, we had the run of the place and were able to wander at will from the dugouts and locker rooms up to the luxury boxes and media suites and over to the top of the Green Monster. It was quite a day. Also in June, I flew down to Atlanta to take part in the 10th anniversary Catholic New Media Celebration for SQPN. At that point I had not taken the job as Managing Director yet, so I was there as a friend and fan and contributor. I didn’t see anything of Atlanta beyond the airport hotel and convention center, but the weekend was well spent. I got to spend time with some of the most interesting people involved in Catholic new media, to brainstorm about ways we can continue our work, and to be inspired and entertained as we did so. This was my fifth CNMC and they’ve always been a delight, mostly because of the people I spend time with. At the start of 2015, it seemed like we were going to have a dry, mild winter. On the day after Christmas, we had gone to the park and walked in light jackets. But by mid-February, we’d already endured the third-snowiest winter on record, getting as much snow in three weeks as we average over two entire winters (October-April). By the time we were done, we’d not only broken the previous record for snow; we smashed it. Just like our poor patio table whose glass top collapsed under the snow. Or our snowblower which gave up the ghost halfway through. So far, this winter replicates the early parts of last winter, but the forecasters say that El Niño this year will keep it that way. I’ll believe when I see it. I’m not much of a prognosticator, but I’m hoping that we can have more of the same this coming year (except for the winter). We don’t have any particular milestones that we’re heading toward, but it’s my hope that 2016 will see us remain healthy as we raise our children in a home that is loving and faith-filled and full of joy. 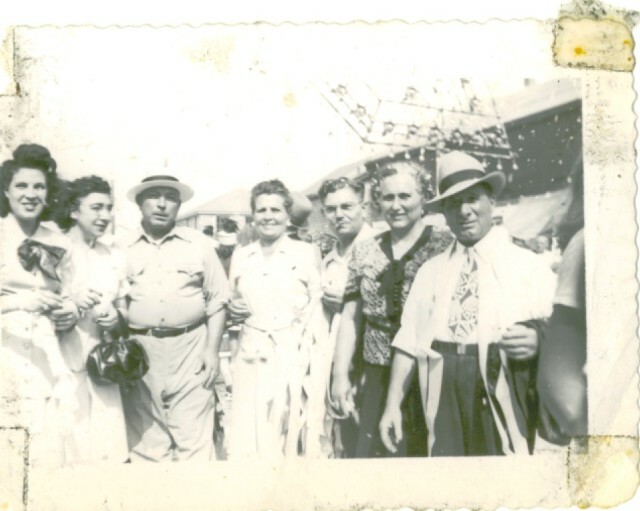 My grandfather “Nanu” Bettinelli is on the far right and my grandmother “Nana” is to the left of him. The other couples are the captain of his fishing boat, another fisherman and wives. It’s Father’s Day and I’m in a reflective mood, thinking of all the dads I’ve known, especially those in my own family, who’ve taught me so much about being a father. I thought I’d share some of those reflections. First, there are my grandfathers, maternal and paternal. My mom’s father, Abraham Spiegel, died when my mom was just 7 so of course I never knew him. But from the stories I’ve heard I have learned about Judaism and the experience of Jewish immigrants from Eastern European areas controlled by the tsars and the progroms of the Cossacks (they emigrated pre-Bolshevik). I have a love for Judaism and my Jewish brothers and sisters that comes from family connections. I did meet my paternal grandfather, Nanu, but he died when I was just eight so my memories are still hazy. “Nanu” Bernardo Bettinelli was not a tall man in physical height, but I remember him as stoic and strong. From my dad’s stories, I know he was touched by tragedy early in life: he was a child born out of scandalous wedlock, but adopted in love; then when he was still a child in a Sicilian fishing village, all his male relatives died in a terrible storm. He first came to the US as a 13-year-old boy working on a fishing boat at the beginning of the 20th century, even working in the Bering Sea on a sailing ship, before survival suits and electronic beacons provided even a glimmer of survivability in case of going overboard. He married my grandmother and when the influenza epidemic struck, he brought them from Sicily to America. When he wasn’t fishing, he was working any job he could find, even in a Ford motor plant in Boston. He was so short, he needed to stand on a box to work the assembly line, which once attracted the attention of a visiting Henry Ford and his acclaim. My father tells me that when my grandfather would return to port from days at sea, he would first stop at the Italian-American club to shower and change into a suit out of respect for his own appearance and for my grandmother. He eventually retired from fishing at 65 and my dad says the captain of the boat told my dad that he would have to hire two men in their 20s to replace my grandfather. Even then my grandfather continued to work as janitorial staff at Mass. General Hospital. From my Nanu, I learned the importance of hard work for your family and that a father’s behavior and appearance reflects on his wife and his children when he’s out in public. 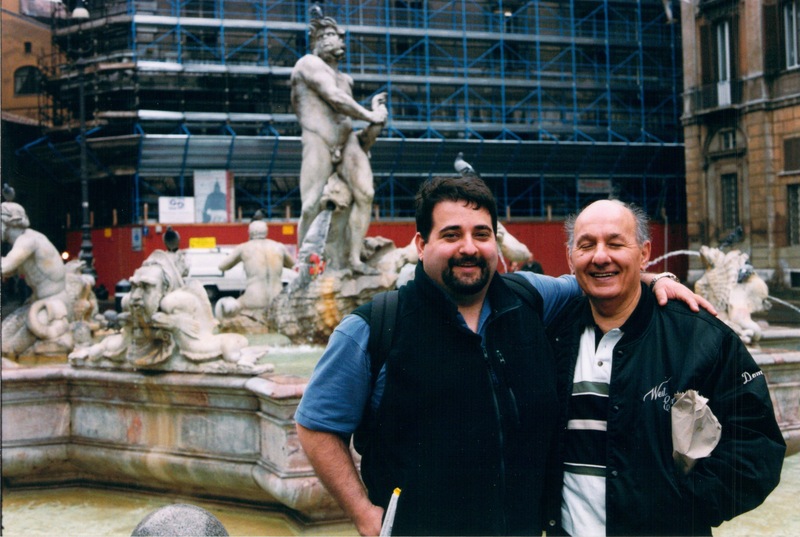 My father and me in Piazza Navona, Rome, in 1999. My own father, Domenico Sr., has also been a hard worker his whole life, working several jobs and six days a week at times. Even now, in his mid–80s and retired after 40 years at Raytheon as a millwright, he still works to provide for his family. As an 18-year-old young man, my father was already working at Raytheon when he was drafted into the Navy. Four years later, he was honorably discharged and the day after getting home he was back at work. In addition to a good work ethic, I also learned that even in difficult times how a father still shows his children he loves them, all of them, even when the children are the ones having difficulties that might strain relationships. From my father-in-law, Randall Scott, I have learned how a strong personal spiritual life becomes a support for living as a strong Christian father. Randy is a secular Carmelite and also serves his parish’s very active St. Vincent de Paul Society. Previously, when he was working full-time for the state of Texas, he also operated a Catholic bookstore on the side that provided a much-needed service to the Catholic community in central Texas. Randy’s strong faith has carried him through the ups and downs of life and now, I believe, provides a quiet yet visible example for his children and grandchildren. My brother, Bernie, has taught me how a husband loves his wife in sickness and in health. His first wife, Kathy, died after a yearlong battle with cancer, and through it all Bernie showed grace and courage and love. He also sacrificed much of himself in caring for her and for their one-year-old daughter Mary who he then had to raise as a single dad for many years until he met his wife, Carol. My brother, John, has been an example of a father raising a large family, struggling at times to provide for them all, but through it all placing a priority on raising them as solid and good Catholic men and women. I hope my own children grow up with as much character and integrity as I see in my nieces and nephews. He has also shown me how to be the strong center around which a family gathers for strength and guidance. My brother-in-law, Peter Campbell, has been a good friend for many years, from even before he met my sister and I have learned from him how placing service to the Lord as a priority in your life is a way to serve your family. Peter is always looking for an opportunity to serve God, including organizing over many years a series of family festivals and concerts and youth events to help others to know the faith and know the Lord like he does. And I see in his eight children a recognition of the importance of serving the Lord first. Of course, these aren’t the only men to teach me valuable lessons of fatherhood, but I’ll stop here with those in my immediate family. To them and to all the others, I give you my sincere thanks and wish you all a very Happy Father’s Day! Communications Director for a three-parish collaborative within the Archdiocese of Boston. In my role I manage all the communications platforms of the three parishes, including the bulletin, posters/flyers/programs for events, a weekly radio program with the pastor, web sites, and social media. My role also includes responsibilities for strategic pastoral planning, which involves the writing of a three-year pastoral plan for the collaborative. Omnifocus is where it all starts. It’s a project and task management app whose central methodology is built around David Allen’s Getting Things Done book. Everything must go into Omnifocus if it’s to get done. It’s where I offload my brain. I have hooks into Omnifocus from Mail, from the web browser, from my phone, through Siri, even. Creative Cloud is the new kid among my indispensable apps. As Communications Director, I’m responsible for the weekly bulletin for our parishes and since I’m on a Mac, I can’t use Microsoft Publisher (and I’m grateful for that.) In addition to using inDesign to put together the bulletin each week, I also use Photoshop to create quick graphics for social media and Lightroom to organize all the photos of various parish events. I’ve been using a service called ParishDesigner.com to do some of the great graphic design we’ve had and I can use Creative Cloud to edit and even adapt the designs to other uses, like turning posters into pamphlet covers. Evernote is my second brain. It’s where everything goes that I will need to find and remember someday and I use it for both personal and work storage. One key way that I use it is that I have a notebook called Parish Bulletin and every time I get something that needs to be in a future bulletin I store it there. I then give it a reminder date of the Tuesday before the Sunday it needs to be in. (I do the bulletin on Tuesdays.) I also precede the title with an acronym for one of the parishes (if it’s parish specific) or ALL, if it’s a general item. Then when it’s time to do the bulletin each week, I just call up everything with a reminder date of the current day. Anything that’s repeating gets a new date when I’m done with it and everything else has its date cleared. This is just one way I’m using Evernote. All my files live in Dropbox (or nearly all; my archives live on a Transporter). This means not only that all my files are accessible from whatever computer or device I’m using, it also means they are backed up and versioned in the cloud. It’s not my only backup solution, of course, but it’s one of them. I do pay to get 100gb of storage. I’m a fanatic about passwords. Just ask everyone I work with and live with. I use almost exclusively 20-digit passwords with numbers, letters, and symbols (unless for some reason the site or software requires a less secure password, which drives me crazy.) 1Password lets me have unique, secure passwords for every site and service and I only need to remember the one password (get it?) that unlocks 1Password itself. And since that password unlocks the software on my computer, it means it never has to travel through the Internet where it could be hacked. I also use the Vaults feature to keep separate vaults for personal and work. I could go on and on about indispensable software and tools, but I’ll stop here. My office has windows on three walls and so I have my back to the windowless wall, of course. The desk itself is an old wooden affair, probably older than I am. On top of it, I have a Varidesk Pro height-adjustable work surface that allows me to elevate the computer to work while sitting or standing. I have so many little hacks and shortcuts that I’ve incorporated into my daily workflow that I have a hard time pulling out one as best. I’ve recently implemented Brett Terpstra’s “Hyperkey” that allows me to re-purpose the caps lock key on my keyboard to become another command key alongside command, option, and control. I can now easily open the site in the current Chrome tab in Safari and vice versa with one key command which allows me to see how a site looks in different browsers. I use another Hyperkey command to create a new Omnifocus task using the currently selected file in the Finder or email in Mail.app. Using a combination of Apple’s Services menu (under the application menu), Automator, and an automation program like Keyboard Maestro allows you to really go far beyond what is normally possible. I named it above as one of my indispensable apps, but it is truly Omnifocus. I’ve been using OF since it’s early beta days and have since snapped up its iPhone and iPad versions. The developers have really embraced the idea of giving you a big inbox into which you can offload anything you need to do. One of my favorite features is the integration with Siri on my iPhone. I can be driving home and activate Siri and then, bam, it’s in my OF inbox. Or I’m emailing with a coworker or a vendor and I want to remember to check back with them at a later date. Every OF user gets a super-secret email address and when I put that in the BCC of the email, a copy of the email gets put in my OF inbox. It’s so powerful and versatile, which has been it’s Achilles heel in the past as well. That power has had the side effect of making it difficult for new users to get started. The developers have done a great job in the past year or so in fixing that and I think it’s easier than ever to get started with it. Besides those two things, I don’t think there’s a gadget I truly couldn’t live without. Certainly my iPad is very useful at both content consumption (e.g. my daily newspaper, Netflix and Amazon Prime movies) and content creation (e.g. mind mapping, project review, meeting notes). I now read almost exclusively on my Kindle Paperwhite instead of carting around paper books. In my car, I use a wireless Bluetooth headset (one ear only) to listen to podcasts on my phone while commuting every day. In the kitchen, I use the Keurig coffee maker daily to make my coffee, except on the weekends when I have a little extra time and use my Aeropress. But as much of a techno geek and gadget guy that I am, I wouldn’t say I couldn’t live without any of them. I think that’s perhaps a good thing. Over the past few years I have realized that I have the ability to capture a spoken conversation in real-time, not word for word, but in its essentials, by typing it as it happens. I learned this skill while working behind the scenes on The Good Catholic Life radio program (which is no more, sadly). One of my duties included typing up a daily transcript of the show which was good enough that we had several deaf “listeners” who enjoyed the program through them. A related but different skill is the ability to type out something while having a completely different conversation with someone at the same time. If I’m in the middle of writing something and a person comes into the room and starts talking, I can continue to write while looking at the person and engaging in conversation. I have no idea how or why I’ve attained these skills, but there they are. Most often, nothing. Our office is pretty quiet and even when I have the windows open (thank God, I once again work in a place where the windows open), I hear mainly the wind. I have tried listening to podcasts, but I either pay too close attention to them and stop working or pay too much attention to work and stop listening. This is especially true of technical podcasts, like Mac Geek Gab or Mac Power Users. More conversational podcasts like those from the SQPN network are much easier to multitask to, but even then I try to keep those for my commute. If I’m listening to music, I have a smart playlist in iTunes called “Lost Hits”, which is all my songs rated five stars that I have not listened to in the past 20 days. Given that I have over 12,000 songs in iTunes and I’m pretty rigorous about rating my music, that playlist can keep me listening for hours. But since it will necessarily only play the very best songs, I also have a playlist called “Lost Near-Hits”, which includes the 4-star songs as well. I’m on a Crusades kick lately so I’m currently reading The Crusades, Christianity, and Islam by Jonathan Riley-Smith, who is one of the foremost scholars of the Crusades. I’ve just started it, so I don’t have much to say about it yet. I recently finished a middling Star Trek novel called Paths of Disharmony and then John Scalzi’s Lost Colony before that, part of his Old Man’s War series. Other books I’ve recently read were Sherry Weddell’s Forming Intentional Disciples and The Sugar Season by Douglas Whynott, about the maple syrup industry, which is quite timely and relevant and was good. I do nearly all my reading on a Kindle these days. For whatever reason, paper books have lost their allure for me. I just can’t seem to finish one in a reasonable amount of time. I don’t know whether it’s because I have to carry around the book or because the actual experience is different. And it has to be the Kindle, not the Kindle app on my iPhone or iPad. The iPhone is too small and the iPad is too heavy. The Kindle is just right and with the backlight set low, I can read in bed with the light off so as not to wake up the toddler. What has changed over the years since you started and what do you do differently? When I first started with Catholic World News back in 1996, I was working from home over a dial-up modem on a PowerBook 520c. There were no content management systems so all our news was emailed out every day to our subscribers through my email app and our web site was a series of HTML files I put together. I had no domain of my own for email, I just had an email address through my Internet service provider. Twenty years later, I’m no longer working from home on a daily basis, but I can essentially work from anywhere as I can connect to the Internet anywhere. My computer’s screen is as large as a large TV was back in 1996. I have a mobile computer in my pocket, a tablet computer on my desk, a portable computer in my bag, all synced automatically through the cloud. Frankly, I’m not sure I could have done this job twenty years ago with the technology of the time, not to the level of professionalism and innovation I work toward. Over the years, I got a DSL line, then cable broadband. I started a web site under my AOL screen name, then bought my own domain. I started a web server in my home office running over the cable broadband then moved to actual offsite hosting for my blog, moving from static HTML files to a rudimentary CMS then to pMachine to Expression Engine and now to WordPress. I’ve edited an online news service and a print magazine, ran social media for an archdiocese, and produced a daily radio show. Each change was made possible through technological advancements that lowered the barrier to entry, but it also ushered in a new era in which doing these things on a shoestring budget with a small staff was possible. Last January 1, I composed a post looking back on the previous year and its highlights and noted at the end my hope to make this an annual tradition. In that spirit, here’s a look back at 2014, its highs and lows, in no particular order. Certainly the highlight of the year was Isabella receiving the Sacrament of First Holy Communion. In last year’s roundup, I wrote about how she made her First Confession in a somewhat spontaneous and unplanned circumstance, so once that was done, it didn’t make any sense to wait for First Communion. So we checked with our pastor and then set a date in early February when my mom would be up from Virginia and Melanie’s sister could come up from Texas. It was a beautiful day and she was so reverent and prepared. I could tell that she was taking this event very seriously, on her own initiative saying special prayers in preparation. A lowlight of the year would be my departure from my job as Director of New Media for the Archdiocese of Boston. It’s a long story and I don’t care to burn any bridges at this point, but I explained it in a post in May. I was sad to leave when we hadn’t yet reached the full potential of what we could in diocesan new media, even as we’d once been hailed as leaders in that area. Unfortunately there was too much uncertainty surrounding my position and the future of my office and I needed to find something a little more stable for the sake of my family. Of course, leaving my job as Director of New Media also meant leaving as producer of The Good Catholic Life radio show, which consequently meant the end of the show, since no one was going to be hired to replace me. After more than 3 years and 750 shows, we’d had a good run. In that time, I’d gone from web guy and transcriptionist to occasional guest to occasional fill-in guest host to producer to co-host/producer. It was a learning experience and frankly not one I sought out, but I did enjoy the people I worked with, both on the radio show and in my my role in new media, and I do miss seeing them regularly. Thankfully, just as I was thinking about leaving another opportunity opened. I’d been discussing my predicament with Fr. Chip Hines, with whom I co-hosted The Good Catholic Life on Fridays, when he said that he might have an opening at his new assignment as pastor of a collaborative of three parishes in Sharon and Walpole, Mass., operating under the archdiocese’s Disciples in Mission pastoral plan. As we discussed the idea, my role became defined as communications director for the collaborative, and I started officially on July 1. In the following six months, we’ve been very busy as we developed a unifying identity as the Matthew 13 Catholic Collaborative, created four new web sites including one brand-new one for the collaborative, created a combined collaborative bulletin, revamped the email newsletters, and implemented a new process by which all of our marketing materials took on a new professional appearance. We’re still in the early stages of bringing the parishes together in the collaborative and I look forward to creating a communications strategy as part of the future pastoral planning process that serves an evangelization plan to raise up more intentional disciples in Walpole and Sharon. As part of my new job, I’ve also made a return to the airwaves. Since November, I’ve been co-hosting on Mondays with Fr. Chip Hines Calling All Catholics, a one-hour call-in show on the Station of the Cross network that covers upstate New York and the Boston area. In 2013, I was excited to start co-hosting a podcast with someone who’s podcasts I’d long listened to, Fr. Roderick Vonhogen. The Secrets of Star Wars is a lot of fun with just me and Fr. Roderick geeking out over the fact that the movies near and dear to both us from our childhoods would be returning to the big screen along with the actors from them. And so when Fr. Roderick asked me last summer to join him in another podcast, I leapt at the chance. I’d only recently become a fan of Doctor Who, catching up on the rebooted TV series most recent 7 seasons over the course of about a year or so. With a new incarnation of the Doctor imminent, the time was right for a new podcast about him. This time it would be an ensemble podcast including Fr. Roderick, Jimmy Akin, Fr. Cory Sticha, Stephanie Zimmer and me. Despite the challenges of coordinating all those schedules and managing such a large conversation each week, I think these podcasts have been both fun and informative and I look forward to many more of them. At the end of July, we took a week to drive down to Virginia to visit my mom and sister who’d moved down there in 2013. We loaded all seven of us into the minivan, piled all our stuff under, over, and around everybody and set off on our 13–1/2 hour road trip. In addition to seeing my mom and sister, we visited George Washington’s boyhood farm, where Isabella was entranced by the archeologists and even found a brick that she altered the scientists to; visited the National Gallery of Art, where among other things we saw an exhibit of works by Cassatt and Degas, then found an amazing Texas barbecue restaurant down the street; had dinner at the home of one of Melanie’s college friends and her husband in the Navy; and saw the National Shrine of the Basilica of the Immaculate Conception with one of our friends from Facebook. It was a whirlwind trip and we didn’t get to do nearly as much as I’d hoped, but everyone had a great time and it was worth it. Perhaps we can do it again this year. Speaking of visits, we once again welcomed Melanie’s mother, father, and sister to our home from Texas, and Theresa even came twice! It’s always such a pleasure to have them here where they can enjoy the kids and experience all that New England has to offer. I do miss visiting them in Texas, but traveling with five little kids is both unwieldy and expensive and thus unlikely to happen again soon. July came with some bad news on the homefront, namely that our beloved pastor, Fr. John Currie, would be getting a new assignment. For several months, Fr. Matt Williams, who was in residence at our parish, had to become temporary administrator before returning to his work at the archdiocese, but eventually a permanent administrator was assigned in the form of the pastor of a neighboring parish. Because of the necessity to juggle two parishes, the Mass schedules were changed and we lost the Mass we could attend at our parish. The reminaing 7:30am Mass was way too early and the 11:30 Mass would result in kids getting hungry for lunch halfway through, which would be a disaster. So we decided to make lemonade from the lemons and start visiting the surrounding parishes on Sundays. This is the Archdiocese of Boston, which means that within a 5 mile radius of our house there are 15 parishes and many of them had a Mass that fell within the sweet spot of 9am to 10am. And so, over the course of the fall, we became the Mystery Worshipper family, giving us interesting insight into what it’s like to be a newcomer and stranger in six different parishes. We might continue our wandering and visiting, but we seem to have settled into a new parish home at St. Edith Stein Parish in Brockton. It’s a very pretty and well-kept parish in a community that has experienced some rough times. The people are nice, the priests are good, and importantly there is no aggravating fluff in the liturgies, i.e. children’s Mass accretions such as childish songs, hand-waving and the like. It is good and homey. Another high point of the year came from via the monks of St. Jospeh’s Abbey in Spencer, Mass., who began distributing the product of their new brewery. The monks are Trappists and prior to last year, there were only eight Trappist monasteries brewing the famous Trappist beers, all of them in Europe. But recently two more were given permission to open, one in Australia and the other Spencer Brewery. At first, Spencer Trappist Ale was available only in limited quantities from certain specialty retailers and only in Massachusetts. It was nearly as much fun hearing friends from outside the state clamor for this long-anticipated ale as it was to try it. Nearly, because Spencer Trappist Ale is an amazing beer, unlike anything else I’ve tried. It’s not what most people think of when they think of Belgian abbey beers, but is a lot lighter and tastes of cloves and other spices. I know that many people who don’t like beer have tried it and really enjoyed it. Certainly the beer aficionado press has gone crazy for it. Now the ale is available in 8 more states, most on the East Coast, but also in northern California, yet it remains as amazing as when it was first released. And it got me more excited about trying other craft beers, especially those brewed locally, which is only a good thing. 2014 was another year in which we took a bunch of field trips as a family. We continued our custom of buying family memberships to two local museums, this year transitioning from the Franklin Park Zoo and the Museum of Science to the New England Aquarium and back to the Museum of Fine Arts. In the first half of the year, we made it to the zoo several times, and it became clear that this was an attraction we could reach very easily if we had a last-minute notion to go there. And we also realized that a trip to zoo in the winter can be nearly as fun as in the summer. We’ve been the MFA several times this year, seeing special exhibitions on quilts, where I got same great photos of these textile works of art, and on the works of Francisco de Goya, as well as their permanent collections of ancient Roman and American art. Unfortunately, we’ve only been to the Aquarium once because for six weeks in August and September, Melanie was in a walking cast. A day of walking on a field trip wasn’t going to happen. I hope to get another couple of visits there before our membership expires in July. Those are just a few of the highlights of the year, not including the usual birthdays and anniversaries, or our weekly trips to the farmers market, the holiday get-togethers with family and more. It is good to look back occasionally and New Year’s Day provides a good excuse to do so, but we also look ahead. In 2015, there are several events happening outside Massachusetts, which I’d love to attend and we’ll see if somehow I can attend at least one. We’re also looking forward to Sophia’s First Confession and First Communion this year and maybe another fun family vacation. Personally, I’m very much looking forward to the new Star Wars movie next December. We can sure there will be much else that’s unanticipated, for good and for ill. I wonder what next year’s retrospective will look like. Today is the 30th anniversary of Apple’s introduction of the Macintosh computer to the world and what an amazing 30 years of technology it’s been. It really was the computer that changed everything. Although it wan’t the first Apple computer to introduce the desktop metaphor (that was the Apple IIGS), the Macintosh made it mainstream and that date marks the turning point from computers being specialized tools that required arcane text commands to operate to tools for the everyman. I wrote about the 20th anniversary of the Mac in 2004 and my history with the computers to that point. But the 10 years since have been among the most monumental for Apple, even if much of the biggest and most disruptive changes wasn’t because of the Macs. To recap: My first Apple computer was an Apple IIe that we got when I was a sophomore in high school, way back in 1983. After that we had an Apple //c and and then an Apple IIGS, which may have been my favorite computer of all. My first Mac was a PowerBook 520c that I got when I was at Franciscan University of Steubenville, probably about 1994 or 1995, and I was one of the early pioneers in taking notes on a laptop in a college classroom. Later, I had brief custody of a Macintosh Centris 610, when my roommate left school to join a mendicant religious order, but I eventually shipped that off to him at seminary in Africa of all places. By then I had joined the Apple’s brief flirtation with cloning when I had a PowerComputing PowerCenter 120, which served me well for many years. The Power Macs were followed by a series of iMacs, including the iMac G4 and the iMac G5. About this time, I also started using a Macintosh laptop alongside the desktops, including an iBook G3 and then the white iBook G4. This is when I switched to using only portables for my personal Mac as I followed the MacBook with a 2007 MacBook Pro and then a 2011 MacBook Pro. Finally, at work I have a handful of different Macs at my disposal including a 2010 27″ iMac, a Mac mini, and a 13″ MacBook. Whew! And I didn’t even tell you about the iPhones and iPads and the Macs owned by family. I suppose it’s clear how I feel about Apple computers and Macs in particular. Yes, I’ve used Windows and even Linux over the years and still do for work, and while Windows has gotten better in that time, it’s still just not as powerful. There isn’t another computer out there that can run OS X, Windows, and Linux on the same hardware at the same time, but Macs can. And OS X has grown into an amazing and capable operating system that will hold your hand if you want it (the graphical interface) or let’s you dig into the guts (the command line interface). Here’s looking at what the next 30 years will bring us.